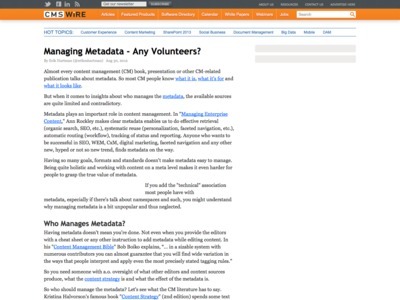 Tim Strehle’s Blog » Managing Metadata - Any Volunteers? Managing Metadata - Any Volunteers? “Librarians and archivists for that matter, are academically trained in using metadata for retrieval and reuse. Though well equipped for the task, most librarians are quite invisible to the web team and on the verge of being fired due to budget cuts. These people can be very valuable for your web team, so keep these specialists on board whenever possible.